A home is both an investment and your family’s shelter. You need to keep it well-maintained and make thoughtful improvements and updates as needed. Doing so promotes its overall condition and integrity, and may also increase your home’s value. Many homeowners schedule regular home inspections so they can learn about any areas of concern. However, all home inspectors are not the same, and some have more advanced tools than others. Thermal imaging in home inspections provides a deeper layer of insight into certain areas of your home. 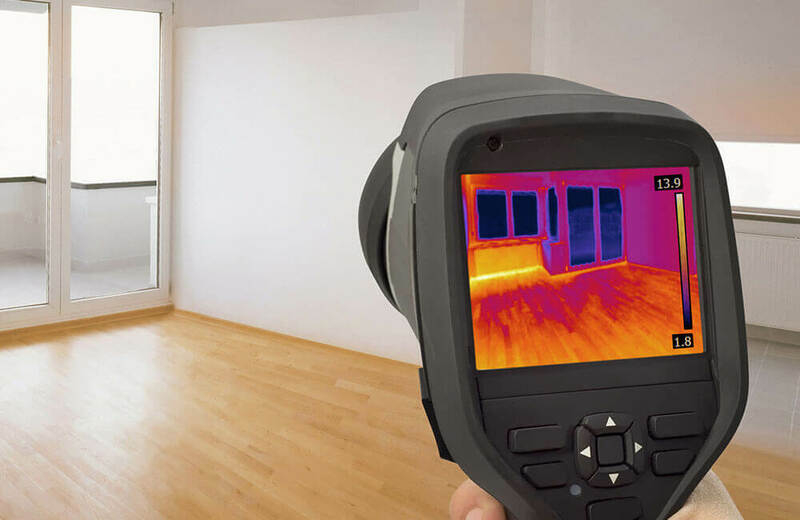 What is Thermal Imaging in Home Inspections? If you are not familiar with thermal imaging in home inspections, you are not alone. This technology uses advanced equipment that detects temperature differences of the object or feature that it’s focused on. When used in a home, thermal imaging can determine which areas are not tightly sealed. It can be used to scan the ceiling, interior walls, windows, and doors. The scan relays important information that helps homeowners make energy-saving improvements throughout their home When used on appliances and mechanical components, it can reveal malfunctions that could be dangerous or causing damage to your home. Here are the most common uses for thermal imaging in home inspections. The composition and function of exterior doors and windows make them susceptible to energy loss. By using thermal imaging in home inspections on these features, you can determine how significant the energy loss is and if repairs or upgrades are needed. For example, thermal imaging may reveal that some of your windows should be resealed. It may also show that upgrading your windows to a more energy-efficient model would be a cost-effective improvement. Thermal imaging can be used to detect temperature differences from the interior and exterior of insulated walls. It may show areas where the builder skimped on insulation or where the insulation has been damaged by pests. Age-related deterioration is also possible, and the thermal scan may show the need to add more insulation or replace insulation throughout the walls and the attic. A significant amount of energy loss happens through the roof of a home. The floor of your attic may be insulated, but the condition of the roof also affects energy loss. Thermal imaging of the roof may be completed inside the attic and from the ground level outside the home. The results may indicate that repair work or improvements are needed near the chimney, vents, and other features of the roof. Thermal imaging may also be used to inspect the plumbing system. For example, a hidden water leak may be difficult to detect until the damage is significant or unless the leak is from a major rupture. Because the temperature of the water leaking from your pipes is different from the wall temperature and excessive moisture shows up as a cool area, thermal imaging can be used to identify the presence and location of leaks. Thermal imaging in home inspections may be a new concept to you, but this tool has been used effectively by home inspectors for years. Now that you understand the many ways thermal imaging can be used to help you care for your home, choose a home inspector who uses thermal imaging for the most comprehensive results. Inspected From Above Home Inspections includes thermal imaging in home inspections as necessary. Contact us to schedule an appointment in the Greater Houston area.